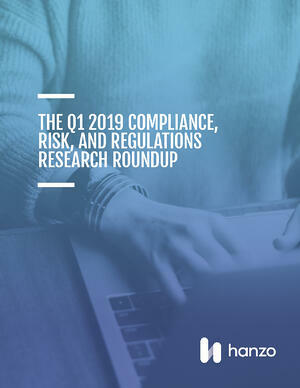 Every quarter, leading organizations in the compliance, risk, legal, and ethics fields publish hundreds of pages of new research. We partnered with Tom Fox, the Compliance Evangelist, to digest and process all of this new information from Q1 2019, distilling it down to some key themes over a few pages that you can read and learn from during your next commute to work, or in between meetings. In this new eBook, you'll learn about the key themes and new findings in recently published reports from the World Economic Forum, Allianz, Ethisphere, NAVEX Global + George Washington University, and Baker McKenzie, as well as regulatory updates and enforcement actions from FINRA, the SEC, and FCPA. To receive a free copy via email, complete the form on this page.